So, nesting is a real thing, huh? 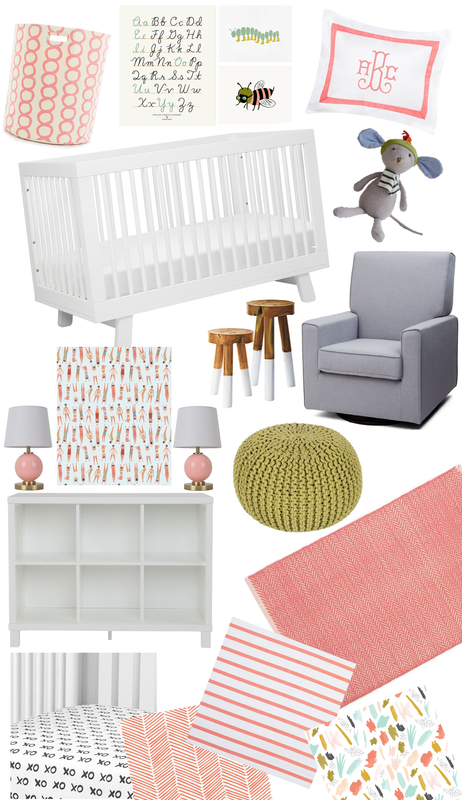 I love me some decorating, but I’ve never really been so meticulous about a “plan” for a room before, until I started thinking about how we’re going to decorate Baby B’s room. We were both on board with finding out the gender, so it’s nice to go into the planning process with a girl-scheme in mind. It’s been really fun to research the pieces we want to use in the space, and now I feel like I have some clear marching orders for what we need to invest in, what we’re adding to our baby registry, and what little details will pull it all together. The Big Stuff! 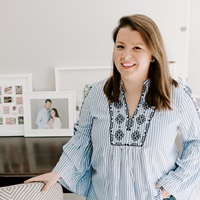 I started to have a few ideas about color scheme for the room even before we found out the gender, but I knew that it was most important for me to research and nail down the “big stuff” for the room before tackling the little details. I knew from the start that the Hudson Crib was going to be our crib of choice. I read great reviews of it online and it has such a clean silhouette. My friends at Wayfair gifted the crib to us and I can’t wait to put together and see how it looks in the space (I’ll report back on how the assembly goes!). Sticking with an all white furniture theme, I’ve honed in on a great storage piece for books and toys from Land of the Nod, the cubic bookshelf. We also need a dresser for this room, and I had the opportunity to browse some of the selection of children’s furniture at Raymour and Flanigan a few weeks ago and decided on their Lindsay Dresser, which has a cute scalloped detail on the front. Raymour and Flanigan also gifted us a great glider for the room, I wanted something neutral and not too big since the room is petite (and so am I!) — it’s going to look super cute with a pouf ottoman and some eclectic side tables. The Textiles. With all of the “big” pieces decided on, the fun comes with starting to play with colors and patterns in textiles. I was on the hunt for the perfect rug for the room to soften up the hardwood floors, and I found this coral rug at Nordstrom that I think will do the trick! For bedding, I added a range of coral and black and white styles to our baby registry that are made up of pieces from different brands. The XO crib sheets are my favorite! And of course I know my mom will always whip me up some throw pillows (a room is never finished without throw pillows!) out of fun patterned prints from Spoonflower. Once we decide on and completely commit to Baby B’s full name we’ll have to add a monogram in there too! The Details. The room is truly starting as a blank canvas, so we need lighting and art and accessories too! I’ve fallen in love with a set of two Rifle Paper Co bug prints that helped me narrow down the color palette for the room, and I plan on framing a fun piece of wrapping paper with lady swimmers on it to pick up a lot of the same colors. My other “must” for the room is some extra lighting since the room only has one small overhead light — a pair of pink lamps from Target’s new Pillowfort kids line may do the trick. After those pieces come together, I’m foreseeing lots of third trimester trips to Home Goods to stock up on fun accessories and storage containers to complete the look! Please Note: I received the Hudson Crib c/o Wayfair, and the Upholstered Glider c/o Raymour and Flanigan. All opinions and design plans are my own. Pumpkin Spice Party Prep. Lemon Poppyseed Donuts and Pulsar. One Response to "Nursery Inspiration."